murder (4.1 percent) (1996-2000). In Cobbs Creek, these violent acts are growing at considerably faster rates than they are throughout the rest of the city (7.1 and -5.4 percent, respectively). Running along the neighbourhood's western flank is Cobbs Creek Park (est. 1904), one of the seven watersheds of the Fairmount Park System. 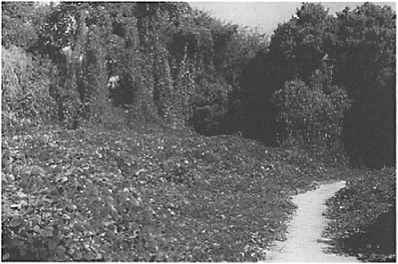 Early in the community's black history (from the mid-1950s through the 1960s), Cobbs Creek Park— the largest public space in West Philadelphia—played an instrumental role in facilitating the production of the neighbourhood's social identity and political development, serving as a meeting place and site of local civic and civil rights activism. Today, in stark contrast, its public space attributes and opportunities have been replaced by growing violence and fear, having fallen victim to the same set of social and economic circumstances that currently afflict the larger Cobbs Creek community, what one Philadelphia columnist has called the "trashing of Cobbs Creek" (Latty 2000). Since the 1980s, violent crime has enveloped the park. In the last decade alone, more than a dozen murder victims have been pulled from the park's forested interior.3 Most of the homicide victims have been female. NINA (early 30s): It's getting—like they found the bodies down in the park in broad daylight. Girls getting raped. Little girls. It's sick!...The point is they finding girls' bodies—raped, dismantled. They found three girls' bodies in the park, right down at the bottom of the hill. JULIA (late 60s): I know you've heard about some of the things that have happened over the last four or five years in the park. There were bodies found. There was about four or five bodies that was found, to my knowledge, in the park. TINA (late teens): I will not go back there. MODERATOR: Why? TINA: Because, I think it was last year, they found a dead body back there in the creek. AMY (late teens): There's probably dead bodies in that creek now. TINA: It was some girl and she was back there dead in the water. The park's social deterioration and its perception as a risky landscape have been accompanied, even expedited, by the physical ecological changes it has experienced since the arrival of blacks in the early 1960s, when budget and personnel cuts and the dissolution of the once omni-present Fairmount Park Guard (see Figure 13.4) coincided with larger demographic changes occurring throughout the city (see Figure 13.5). The park's narrow geography has resulted in severe ecological and structural changes that neither the local community nor the Fairmount Park Commission has been able to adequately respond to, either politically or economically. Today, extensive patches of non-native, weedy growth combine with the ambient risk of violence to produce a wideranging and increasingly gender-specific fear that is demonstrative of a perceived complete loss of social control aimed directly at the park's ecological structure (see Figure 13.6). RACHEL (late teens): It's like there's forest back there. Once you get past the playground there's like a whole lot of trees and weeds and stuff. So once you get back there, once you get behind that part of the playground anything can happen to you! MODERATOR: Are there certain parts of the park that you think are less safe than other parts? TONYA (late teens): In all those invisible places. KATE (late teens): Behind all those trees. TYREISHA (late teens): It's like if you go back there behind the playground, the trees are not safe. TYRONE (late 40s): The grass isn't cut. You can't see because of all the weeds. The weeds are out of control. We won't allow our kids to go but 6 or 10 feet into the [woods] because of all the weeds. We can't see them. That's so dangerous. Anything can happen. Kids can get stabbed, kidnapped, murdered. 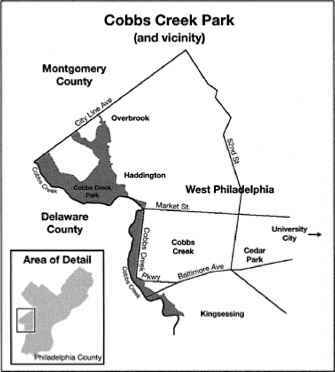 As a result, Cobbs Creek Park has, for all intents and purposes, been abandoned by, especially, local women and children who would rather deny themselves the opportunities that come from public space access and participation than risk the possibility of violence (see Warr 1985; Valentine 1989). MONIQUE: I'm 34 years old and I don't even take my kids there. I don't even mess with it and I live on the top of the block. My block comes right down—at the bottom of my block I'm right at the park. I don't even walk my dog there... My kids used to play in the park before it got like it is now. My kids don't go in that park! My kids do not go down in that park [emphasis in original]. NASHEEDA (late teens): I will not go down there by myself. I will not! I see people walk down there, walking on the trail by themselves, and I'll say "Are you sure you want to walk down there?" I'm not going! SHIRLEY (early 60s): I don't do anything over there. Absolutely nothing. And I love the park! Clearly, local ecological conditions in Cobbs Creek are interpreted by the community's residents as indicative of the greater social problems that accompany racial spatial segregation, generally; to this end, uneven, out-of-control ecologies are discursively linked to the social histories and geographies of racism, economic inequality, and a culture of political neglect that have plagued Philadelphia for the past century (Adams et al. 1990; cf. Heynen 2003). Uncontrolled ecologies are interpreted locally as racist ecologies. Unsurprisingly, accusations of racism and park mismanagement abound in Cobbs Creek, but the history of neglect is well understood even amongst park authorities. Indeed, the director of NLREEP reflects on the matter concisely, portraying (if not exactly displaying) the "out of sight, out of mind" philosophy that has long-governed Philadelphia's racist political geography, even in park governance. [Cobbs Creek Park] is not as visible to most people. And I think the resources of [Fairmount Park], what they have, they want to go into areas that are most visible to important people. People that live and work downtown or people who live in [exclusively white, upper-middle class] Chestnut Hill and work downtown, or that are driving through these areas. That's where their priorities are; places that most people see [emphasis added]. The racist ecologies of Cobbs Creek are, it appears, the result of a deliberate campaign to steer (scarce) resources towards and emphasize the place-making process in those areas of the city widely considered to be economically lucrative and politically powerful (e.g., Center City, Chestnut Hill), disproportionately putting marginalized black communities at the (environmental) risk of violence victimization. However, results of this legacy extend beyond the production of uneven ecologies, the disproportionate distribution of risk, fear and avoidance, or the collective resentment over the politics and geographies of race-based neglect that have governed park management priorities; indeed, for many in Cobbs Creek, it seems that this collection of factors, patterns, processes, and circumstances have combined over time to condition and justify the formation of a "new" narrative of the normative, controlled landscape. Here, the antithesis to uncontrolled, racist nature—the manicured lawn, or garden—has emerged as the ideal of the well-tended, well-managed, well-groomed, equitable, aesthetic, fearless, and, most importantly, accessible urban ecology (cf. 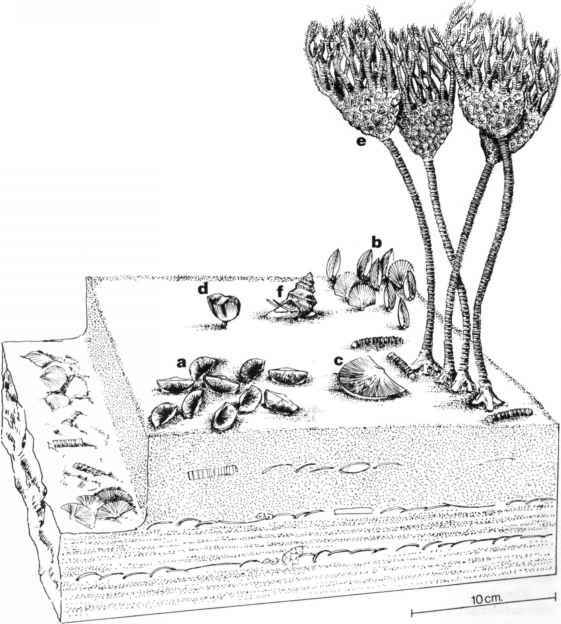 Robbins and Sharp 2003). JULIA (late 60s): I start hollering for...the greenery to be cut, and for the grass to be cut and all that stuff. I found that it's not necessary to be a mover and a shaker but if you start screaming loud enough you're gonna be heard eventually. And they [the Fairmount Park Commission] knew that these things should have been done, but they're like, "Hey, if you don't care we don't care!" LAUREN (early 50s): [comparing Cobbs Creek Park with a park surrounded by white communities] That park is so beautiful! It is so beautifully grassed all over.. .It's such a big contrast!...They have a spot to be proud of...And they have to be very restrictive about who comes in there, and they are and there result is a beautiful park.. .It's like from zero to a hundred in difference in the way it looks [compared to Cobbs Creek]. Surely, the two narratives of controlled nature (lawn vs. restored, native ecology) are poised for conflict, calling forth the age-old debate of the tamed, domestic garden vs. the untamed wilderness (Glacken 1967; Schama 1995) albeit in a distinctly different, historically contingent, urban social economic context. I close this chapter with thoughts on their possible articulation.